Boost your School Achievement Score and increase your School Performance Grade in just one day! Designed specifically to increase the number of your students scoring Level 3 and Level 4 on the NC Math 1 exam. We strive to help all students reach Level 3 and Level 4. 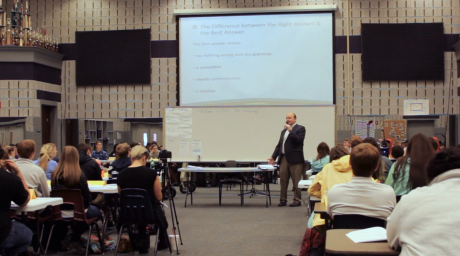 NC Math 1 plays a crucial role in measuring a high school's accountability in math. Directly aligned to the North Carolina Standard Course of Study that appears on the NC Math 1, the NC Math 1 Boot Camp is a half-day event designed to increase the number of students scoring Level 3 and Level 4 on the NC Math 1 assessment. Students will be prepared for both multiple-choice and grid-in response items. Students will also practice calculator-active and calculator-inactive question types. Through extensive research and careful analysis, our Boot Camp workbooks contain the most frequently tested content in the same proportion as found on the NC Math 1 according to NCSCS standards. Fill out the quote request by April 20th and we guarantee to fit you into our availability this semester. Call (855) 922-8773 or fill out the form above to learn more about how we can help prepare your students for the NC Math 1 test. Our presenter was fantastic! She was very good at keeping everyone engaged the entire day!